Our commercial blinds division offers a complete turnkey operation for the installation of a comprehensive range of products. We manufacture everything ourselves to give complete control of delivery times and cost. We use only the best quality components and products from the UK’s market leaders in this field. Our commercial blinds design, manufacture and installation service enables us to provide you with the best possible window solutions. As highly experienced contractors, we can adapt our services to create the perfect system for you with the minimum of disruption. Our in house design team can work with you to create completely bespoke blinds from scratch, turn your ideas into a plan, or building to your full specification. We often work with architects or interior designers who already have a strong vision of what is needed, however if you are not having such extensive work carried out we are here to help you craft the right system for you. As we work with a range of commercial clients, we are able to understand the needs of very different environments. For example, we can create designs that will match the branding of your company and bring this into your office, or we may need to create technical blackout blinds as needed in laboratory work spaces, for example. In schools and hospitals we may need to include anti-ligature systems for extra safety or we may install motorised and automated systems for hard to reach areas. We take into account many different variables which will determine what is the right blinds system for you, adapting the costs of the project to your budget and making sure that your investment is spent wisely. As specialists in commercial curtains and blinds we work in many sectors, ranging from large scale building contractors to small local businesses as well as schools and universities. Our workshop on the outskirts of Preston enables us to be provide an outstanding level of service to all of our clients across the North West. Take a look at our Mottura range of vertical blinds by clicking here. It is by combining both the design and manufacturing of blinds systems that we can envisage and create a superior product. We utilise an extensive selection of Italian made Mottura components as we have simply found these to be the best option in the long run. Our workshop is very well acquainted with these precisely engineered parts and we are therefore able to build blinds to a very high standard quickly and repeatedly. To create your bespoke blinds, we can draw on our full catalogue of fabrics. These enable us to create a variety of aesthetics and achieve a number of functionalities. Where necessary, we can create blackout blinds or even carry out printing, to carry your business’ logo or message into your interior. We are very proud of the level of professionalism with which we carry out every one of our installations. We are fully aware of the impact that having interior or exterior work can have on your business, disrupting your work and distracting your customers. We do all we can to cause the minimum of annoyance. We are able to keep to agreed deadlines and work within tight timeframes, ensuring that you are not delayed in getting things completely back to normal. 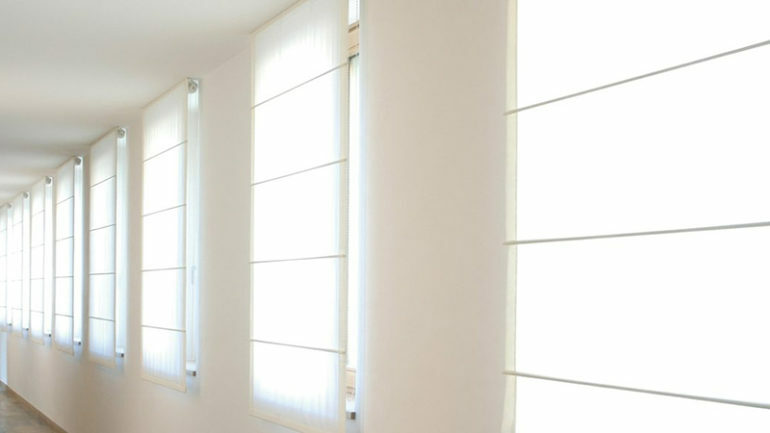 As each of our very experienced staff is well acquainted with the materials and systems that we use, you can be sure that your blinds will be installed to the highest of standards. It is not just the quality of the blinds systems we produce, but also the standard of our workmanship that ensures we can achieve outstanding customer satisfaction. We carry out full risk assessments to ensure the safety of everyone on site and are accustomed to working in unusual environments such as hospitals, nursing homes and schools. If you have any special concerns or regulations for your situation do not hesitate to contact our team who will be happy to help. Even after installation is complete, we continue to carry out a high level of after care so that you can get the most use and the longest lifespan from your blinds. If you are in need of blinds systems or window solutions and a contractor you can trust, get in touch with our team today.